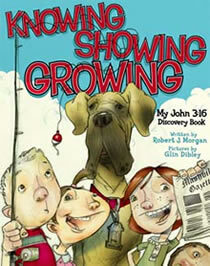 "Knowing, Showing, Growing: My John 3:16 Discovery Book"
This new book by Robert J. Morgan helps parents of elementary school-age children clearly explain to their kids what it means to receive Christ as Savior, follow Him in baptism, and begin the basic habits of the Christian life (Bible reading, prayer, obedience, and witnessing). Fun, illustrated short stories with colorful characters like Mary Motley, Herman Hackler, and Lola Nola Mazola easily connect to highlight the exciting message of John 3:16, and meaningful discussion between parent and child. With its prayer suggestions, memory verses, and well-arranged content (ten chapters that require no more than thirty minutes each), the book is even suitable for Sunday school and small group settings. Robert J. Morgan is a best-selling Gold Medallion Award-winning author, a staff writer for Dr. David Jeremiah's Turning Points Magazine, and has also served as pastor of The Donelson Fellowship in Nashville, Tennessee, for nearly thirty years. He holds degrees from Columbia International University (BS), Wheaton Graduate School (MA), and Luther Rice Seminary (M.Div.). Morgan and his wife have three daughters and five grandchildren. This book is mainly to serve the purpose of embracing the Bible, and daily lessons that can be learned in everyday settings as a child. Each chapter provides a short story, followed by a set of questions to answer and relate it to yourself. This book would be perfect for third graders and up (possibly pre-K with assistance). I could see my nieces reading a book like this one, who have been baptized and whom attend church regularly. I would recommend a Sunday School teacher, or possibly a pre-K class with religious backgrounds using this book on a weekly and/or monthly basis. The illustrations are cute, but not colorful (maybe the owner/child of the book could color it themselves). Thank You so much Net Galley and B&H Publishing Group for allowing me to read this book! I cannot wait to read more books from you in the future!